"If Murder is Satan's eldest son then Poison, Queen of the Night, is his favourite daughter." Kathleen Ernst lives up to her promise in The Heirloom Murders, her second mystery featuring Chloe Ellefson. As readers learn in the series opener Old World Murder, Chloe is a collections curator for a replica of an antique Wisconsin town. Chloe is responsible for maintaining the authenticity of the town, which entails preserving for public consumption both the artifacts, surroundings, and cultural conventions of model Old Town, Wisconsin. Unfortunately, the present intrudes, introducing contemporary crime to the tranquil village. Much of the novel centers upon the history and attraction of the Eagle Diamond, a precious stone that vanished long ago. Murder and mayhem ensue as the chase for possession of the diamond escalates. Oh, and don't forget the romantic subplot that pits Chloe's ex-fiancé, another collections curator, against her new love interest, a lowly cop. 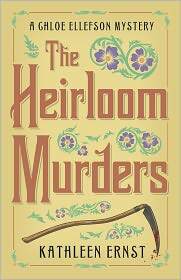 Read The Heirloom Murders for entertainment and edification. "There’s nothing wrong with Southern California that a rise in the ocean level wouldn’t cure."